Yes, I want to support Habitat's mission to build simple, decent, affordable homes for qualifying low-income families in the greater Wenatchee area. Employees from Washington Federal presented a check to Board President Don Dimmitt from their "Locals Know Best" campaign held last fall. Charitable organizations were voted for by members of the community and WA Federal donated $5 for each vote up to $3,000. 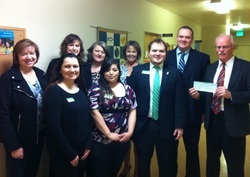 Thank you Washington Federal and our community for your support! We are pleased to partner with Sav-Mart who has generously donated a new dishwasher to every home we have built since 2015. Thank you Sav-Mart for your support! Partnerships with the following companies provide much needed donated materials for Habitat homes nationwide including, mini-blinds, ranges and refrigerators and lock sets for interior and exterior doors.